assembly of communications equipment, stamped military identification tags, wire harnesses made for the military and other war effort manufacturers, military police night sticks and hot stamped wire markers to military specifications. appliance wire harness manufacturers in the midwest (the home of most appliance manufacturing for the country at the time). It also continued on in the communications industry doing work both on the consumer radio side of the business and in commercial broadcasting equipment. By then Excel had moved to a 10,000 sq. ft. location on the North side of Chicago Illinois. This location was very close to several means of public transportation and a large competitive local work force. The location used to be a Studabacker dealership. As Studabacker fell on hard times this city block long building became available. 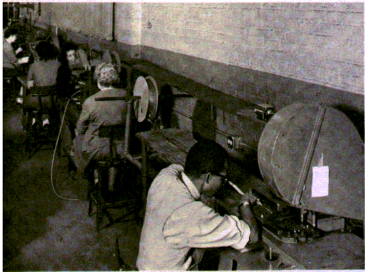 Through several decades of change, both to the appliance and communications industries the former with its move to manufacturing and headquarters to the Southern States and then to offshore manufacturing, the later to solid-state technology and offshore dominance and the overall structure of Chicago and the Midwest from manufacturing to service sector Excel has had to adopt and change once more. Excel is still a supplier to the appliance industry but has moved into the medical, lighting, HVAC and industrial controls and equipment industries. We not only manufacture wire harness to UL and CSA standards along with heat shrink markers but also provide eyeleting services and act as overflow assembly production for our customers as needed.